TVB’s long-running sitcom Come Home Love <愛·回家> is finally coming to an end. The Ma family will say their last goodbye on April 1, 2016. The popular sitcom about Hong Kong’s favorite family premiered four years ago on May 14, 2012, with Lau Dan (劉丹), Tsui Wing (徐榮), Lai Lok-yi (黎諾懿), Yvonne Lam (林漪娸), Florence Kwok (郭少芸), and Carlo Ng (吳家樂) leading the cast. After airing its 804th episode on July 3, 2015, Come Home Love continued with a sequel series, featuring new main cast members. However, the sequel was met with mixed reviews followed by a ratings dip, prompting the producers to bring back the original cast to round up the final episodes of the series. 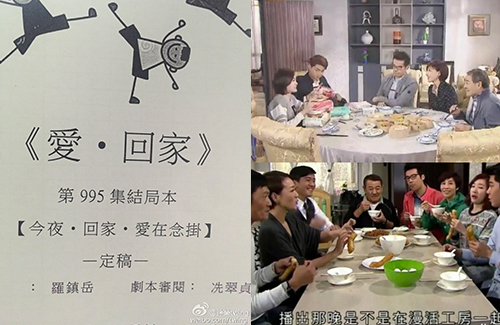 Come Home Love will air its last episode, the 995th episode “Tonight, Come Home, Loving Memories” <今夜·回家·愛在念掛> on April 1, 2016, just short of its fourth anniversary. Succeeding Come Home Love’s time slot will be another new sitcom featuring Some Day <天天天晴> actors Teresa Mo (毛舜筠) and Wayne Lai (黎耀祥). The comedy series, which revolves around a television production company, stars Wayne as a television producer and Teresa as his multi-talented assistant. Chung King-fai (鍾景輝) will star as Wayne’s father and Power Chan (陳國邦) will star as Teresa’s young uncle. The new series is produced by Law Chun-ngok (羅鎮岳) with a script by Sandy Shaw (邵麗瓊). About the new sitcom, which is still untitled, Wayne said the series is set in a trendy media atmosphere, and will include many pop culture references, especially from entertainment gossip. Why not round it up until 1000, 995 seems like such an odd number for it to end at. I’m looking forward to a new sitcom though, even though original cast is boring me a little bit now. Guessing that it never made the rating level even with the return of the old guards?? @kangaroo Yup! Not only that, the part that irritated me most was the management forcing the scriptwriters of the show to come out and do interviews where they not only tried to ram part 2 down everyone’s throats, they also slammed HK audiences in the process, claiming that those who criticize their show have no taste (amongst other things). Um, sorry TVB, but slapping the hand that feeds you is a stupid way to rally support for your cause (especially when the audiences’ criticism is valid and warranted). I personally was on the fence about giving part 2 a try but after that interview, I was completely turned off to even giving them a chance. Those execs at TVB need to go back and take Public Relations 101 so they can stop making so many dumb decisions that do nothing but alienate their audiences!